The KSCO-2007 conference brought practitioners and key decision makers in coalition operation management together with researchers from areas of knowledge representation and reasoning, planning and multi-agent systems in order to exchange experience and ideas, share inspiration and suggest novel concepts. Practitioners benefitted from meeting each other and from learning possibilities of research achievements while researchers got inspiration from each other and potential end users of their ideas. Lawton, J., Patel, J. and Tate. A. (eds.) Proceedings of the Fourth International Conference on Knowledge Systems for Coalition Operations (KSCO-2007), Waltham, MA, USA, 1-2 May 2007. In Proceedings of the IEEE International Conference on Integration of Knowledge Intensive Multi-Agent Systems Modeling, Evolution and Engineering (KIMAS-2007). 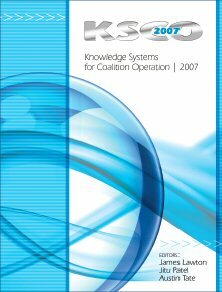 KSCO - Knowledge Systems For Coalition Operations is an international working group exploring research in Knowledge Systems for Coalition Operations. KSCO regularly organizes a technical conference where practitioners and key decision makers in coalition operations management meet and discuss with researchers from areas of knowledge-based systems, planning and multi-agent systems, exchange experience and ideas, share inspiration and suggest novel concepts. It can also lead to joint project proposals. After successful events in Edinburgh, UK, Toulouse, France, and Prague, Czech Republic, the KSCO conference in 2007 was held at the Westin Hotel in Waltham, Massachusetts (USA), in conjunction with the International Conference on Integration of Knowledge Intensive Multi-Agent Systems (KIMAS-07). The goal of the 2007 conference was to foster the formation of collaborations between coalition practitioners and the academic community. Joining with KIMAS furthered that goal by leveraging the operational background of the regular attendees. The format of the conference consisted of two days of sessions which will be a mixture of keynote talks, research paper presentations, panel sessions and "Birds of a Feather" style breakout meetings.